In longboards, there are pintails, and then again there are pintails. The Ant is an example of one type; the tail hip is moved back and elongated to produce a crack-the-whip turn. The Scorpion is the other type; the pin is “added” to a squaretail template- the hip, fin, and pivot remain the same, “V” in the pin keeps it from sticking during pivot turns. The difference shows when you commit the board on rail- pins carve like no squaretail can. The Scorpion carries a generous nose with a slight concave, with a medium width, and a medium to pinched 50/50 rail throughout. 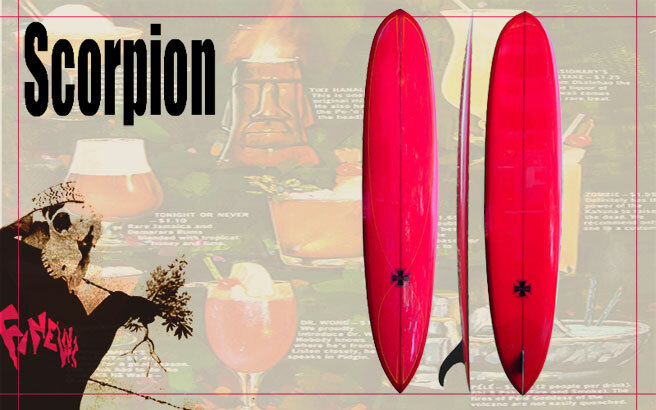 The glass-on is a carve-friendly dedicated Scorpion template. With a box, the Greenough 4A has the same, but more forgiving vibe. A Velzy Noserider enhances pivotability.